Seems like MLP gets a bunch of awesome, expansive backdrops in some episodes, and I wanted to try my hand at vectoring one of them. Oh, and this backdrop is from S1E4: Applebuck Season, right after Applejack goes all dark-matter on Rainbow (Catapult scene). 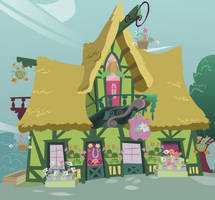 Does anyone have a continuous Ponyville street bg strip? Or separate images that could form one? Anything like that? I hope you don't mind, I couldn't find any rules on usage and such, but here's a link to what I did..
Would it trouble you if I use this for my IT assignment? Thanks. I snatched a bit of your blustery sky for my FIMFiction avatar. Thank you. Any chance of getting the SVG version of this? The classic! Very well done! I used this here [link] Thank you! I thank you for creating this. This is great! Do you our anyone else know where I can find more backdrops like this? I can't figure out a good search term since 'background'gives me thousands of wallpapers. Sure do, there are a bunch of groups that have sections dedicated for backgrounds like this. That's a really cool view Keep up the good work! Hm, might just be an error in the show's artwork then. I'll get to and fix that right away! You're a brave soul vectoring something with such details. The windmill will easily remind me of, tick tock tick tock the sun moves. powerfully well done yo. and the details are awfully superb. no doubt this took you long to do so. The water on the right of the bridge is overlapping the bridge itself. Otherwise absolutely amazing! I made another wallpaper with this, may I submit it crediting you? Go ahead, I'm pretty happy this is getting around anyways. Holy crap man, this is stupendous! Amazing job! Awesome vectoring there! ^_^ Must have taken a long time (and a lot of layers).